But at Friday’s hearing, Judge Paul Haakenson took guidance from county counsel Brian Case, who laid out the county’s position that the 2016 architectural significance designation was invalid. In the end, he finalized a tentative ruling that denied Mr. Hoffman’s motion, though he added some sympathetic orders. Facing nearly a million dollars in penalties for extensive unpermitted building, tea purveyor and longtime Lagunitas resident David Lee Hoffman has taken a new stand to defend his property. Attorney Peter Prows filed a motion on his behalf in Marin Superior Court this month that argues for the validity of a determination of architectural significance bestowed by the Marin County Architectural Commission. The county had discounted the commission’s 2016 determination for the property—which Mr. Hoffman calls “The Last Resort” and built as a model for sustainable living. Meanwhile, around 1,500 of Mr. Hoffman’s friends and neighbors signed a 2017 petition in support of reconsidering the architectural designation. In his recent motion, Mr. Prows provides a legal defense for its ongoing validity. He also argues that it provides the most practical path forward, since the designation would allow the property’s roughly 30 unpermitted structures and illegal gray and black water systems to comply with California’s historical building code rather than the state’s stricter building code, which contains thousands of pages of prescriptive technical requirements. The historical building code is a 27-page document intended to be “performance oriented rather than prescriptive” out of recognition of “the unique construction problems inherent in historical buildings,” the code itself states. To comply, designated buildings or properties must address unsafe conditions, yet do not need to meet regular code. Mr. Hoffman has commissioned a plan from San Anselmo architect Adam Posard that demonstrates what it would take to meet the historical code. Although Mr. Prow’s motion, which will be considered in September, may provide a new direction for the county for bringing the Lagunitas property into compliance, Mr. Hoffman remains in hot water. In 2015, the county put the property under the control of a receiver tasked with bringing it into compliance after Mr. Hoffman failed to meet a 2012 court order that both levied $226,672 in fines and mandated that he demolish all illegal structures at his own expense. And Mr. Hoffman’s fines have continued to mount. According to an account from the receiver last month, Mr. Hoffman owes roughly $821,115, including for administrative penalties, delinquent property taxes and the receiver’s fees. Mr. Hoffman has moved much of his tea business, the Phoenix Collection, to a brick-and-mortar shop in Lagunitas and, per court order, halted all construction, though he continues to live and work on the property, which features many Asian-inspired creations stemming from trips to China to buy his choice pu-erh tea. A hearing scheduled for Sept. 28 will address both a July motion from the receiver, attorney Paul Eric Beatty, for further court instructions and the approval of another hit of fees as well as the motion filed last month by Mr. Prows, who requested that the historic designation be considered in the receiver’s plans. Last November, after two years spent consulting numerous federal permitting agencies and consultants, Mr. Beatty made his first report on the measures he wanted Mr. Hoffman to take to address “immediate health and safety concerns.” In addition to roping off a host of structures, he recommended Mr. Hoffman demolish a garage and a storage building because they encroached on the public road that borders the property. 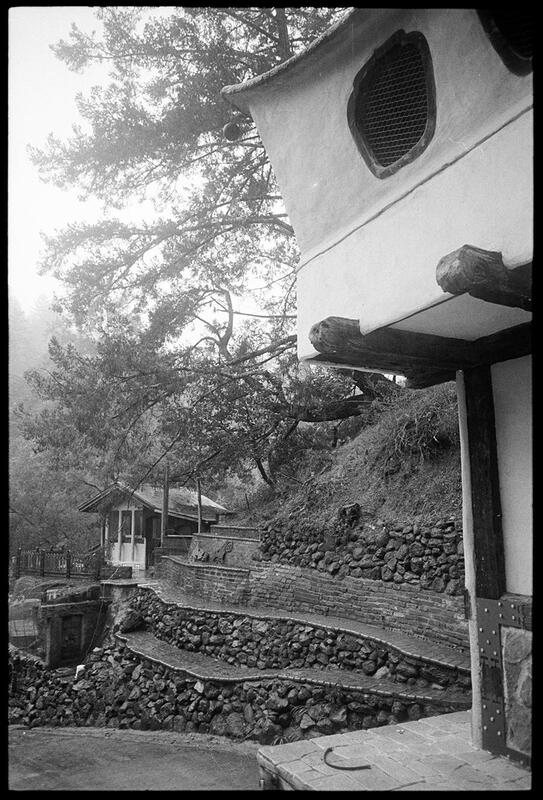 But at that time, Marin Superior Court Judge Paul Haakenson largely overruled Mr. Beatty—whom he appointed to help bring the property up to code—postponing the demolition and allowing Mr. Hoffman continued access to much of his property—with the exception of his teahouse, which was roped off. Judge Haakenson also allowed Mr. Hoffman the opportunity to provide plans and obtain the necessary permits to modify the structures so as to comply with the required setbacks. He instructed Mr. Beatty to oversee those modifications. In a motion filed on July 19, however, Mr. Beatty reported that Mr. Hoffman had only partially met expectations. “The sum substantive response from Mr. Hoffman thus far has been a concession that structure 3 must be ‘sacrificed,’ and a statement that structure 4 should be moved. Mr. Hoffman has not, however, provided the receiver with any plans, studies or information which suggest that he can and will move structure number 4,” he wrote last month. Mr. Beatty requested permission from the court to employ a licensed demolition contractor to demolish and remove the two structures, which he estimated will cost $25,000. The receiver lamented that course of action, but pegged the blame on Mr. Hoffman. “To be clear, the receiver requests instructions to demolish structures 3 and 4 reluctantly, and in view of two facts. First, both structures cannot be permitted to remain in their current locations under any circumstances. Second, Mr. Hoffman has simply done nothing—at least as far as the receiver can ascertain—to develop an ameliorative plan to either move or modify the structures in question,” he wrote. To meet his request, Mr. Beatty asked the court to authorize a new certificate of indebtedness. In 2016, the court authorized him to borrow $93,000 by way of an initial certificate from the lender Gohl Insurance. The second certificate, if the court approves it, will become the primary lien on the property, loaned by Gohl at an interest rate of 14 percent for a term of six months. Can Mr. Beatty keep racking up the bills, if Mr. Hoffman continues not to pay? According to Mr. Beatty, if Mr. Hoffman does not at least pay the current $385,962 in delinquent property tax assessments, the property will be auctioned as early as next year. At the scheduled hearing in September, Judge Haakenson will consider Mr. Beatty’s request for more funds and issue directions about the demolition. The application was supported by three expert analyses of the cultural significance of The Last Resort. Sim Van der Ryn, a former California state architect, lauded the “advanced ecological design” of the property, comparing it favorably to the work of Frank Lloyd Wright, “another notorious code violator.” Jo Farb Hernandez, director of SPACES, a nonprofit dedicated to the preservation of historically significant art spaces, said “there could be no better example of a site worthy of preservation, on so many levels, than Marin County’s The Last Resort Lagunitas.” And Mark Hulbert, a licensed conservation architect and cultural resources consultant, placed the property on par with the Civic Center for historical importance to Marin. In April 2016, the commission unanimously voted to approve Mr. Hoffman’s application. “We enthusiastically thought David Hoffman’s house qualified. It’s a walk-through sculptural garden,” Commissioner Bruce King told the Light at the time. Yet within days of the commission’s vote, the designation was suspended. William Kelley, a staffer with the county’s building department and a non-voting member of the architectural commission, sent an email taking the position that the receiver’s approval was necessary. Mr. Prows argues that there was no subsequent commission mention or motion relating to undoing the designation. “The non-voting ex-officio member has no authority on his own, in an email, to rescind or modify a historic-designation decision previously made by the Architectural Commission,” he wrote of Mr. Kelley. Therefore, Mr. Prows argues, the designation is still in place. How should the court proceed? Mr. Posard, Mr. Hoffman’s architect, has prepared a plan to bring each of the structures into compliance with the historical building code. The plan includes making safe all unorthodox structures, including a pond and composting toilet, that would be particularly problematic under the regular code. That plan should be the basis for Mr. Beatty’s renovation of The Last Resort, Mr. Prows argues. David Lee Hoffman will not show me his tea cave. The Lagunitas cave where Hoffman, owner of the Phoenix Collection, is aging tens of thousands of pounds of tea is well- known in the industry. “All in This Tea,” Les Blank’s 2007 documentary about Hoffman, pictures him loading boxes into it. Marin County, which has been suing Hoffman for more than a decade to bring his 2-acre estate to code, has listed the cave in its extensive complaints. stored at the Last Resort, his home and “ecological research center” in the Lagunitas hills, are puers, a genre of Chinese tea equivalent to cult Cabs or single- malt scotches. Hoffman is one of the most storied tea vendors in the United States, and his puers may be worth millions of dollars, albeit to a minuscule cadre of collectors. As the Phoenix Collection spends down the tea Hoffman has accrued, these serious collectors have found their way to him. Sales, he says, are growing, as is Hoffman’s sense of urgency. Lyme disease, a recent diagnosis, has inflamed the 73- year-old’s joints and sapped his energy. At the same time, Marin County is fed up with Hoffman, who has built 36 structures on his property over the course of 45 years without county permits. Since 2015, the property has been under court-appointed receivership. At some point, the tea party will end. Hoffman doesn’t know whether he’ll emerge with any money, a home or tea. It takes determination — which, in the Internet age, means a phone call — to learn that the Phoenix Collection actually has an office in a strip mall down the hill from the Last Resort, and that it is open to the public on Saturdays from 10 a.m. to 2 p.m. When I visit, then, the hubbub inside comes as a surprise. Six of the carved stools around the tea station have tiny white cups set before them. Two women in their 60s sip from theirs admiringly, watching their partners saw through a 6-foot-long cylinder wrapped in palm leaves and stuffed with Hunanese hua juan tea. A young woman in a peasant dress stops by to give Hoffman vinegar she has made from his apples. Another couple peruse a display of puer tea cakes on display in the shop’s Tea Museum, murmuring over the rounds, the bricks, even a wizened pomelo stuffed with fermented leaves. Dressed in a blue shirt with Central American embroidery and his customary pageboy cap, Hoffman beams genially at the bustle, calling customers back to their cups each time his assistant, Nawang Tsomo, pours a new round. Part instructor, part host, he regularly darts outside to reposition a silvery solar cooker in the parking lot, returning with warm whole- wheat breads baked inside. To find so many people interested in tasting esoteric teas is due in part to Hoffman’s proselytizing. When he started Silk Road Teas, his first tea company, 25 years ago, puer (sometimes spelled pu’erh, and pronounced POO-air) was even more rare in the United States than it is today. Puer comes from Yunnan province in southwest China. In the 14th century, cosmopolitan tea culture in China began brewing loose-leaf tea, but remote Yunnan continued to press tea into cakes for easy transport.. By the 1970s, the tea was almost a curiosity, prized mainly by Yunnanese locals, Tibetans and Cantonese. The latter discovered that as the cakes traveled to southeast China’s sticky, sweltering climate and lingered in storerooms, their flavor became deep and robust, the ideal complement to dim sum and rich stews. According to Jinghong Zhang, author of “Puer Tea: Ancient Caravans and Urban Chic,” in 1973 one tea factory, recognizing Cantonese appetites for these earthy older teas, developed a method for fermenting tea leaves to replicate many of the effects of aging. Since then, puer has been divided into two classes, the artificially fermented or “cooked” (shu) and the “raw” (sheng). Cooked puer, which brews up almost as dark and opaque as cocoa, can smell like wet leaves or moist humus, with a fruity sweetness and a viscous, satiny body. Young raw puer resembles green tea, orchids and honeyed stone fruits floating over base notes of hay and toast, with a bitterness that nips the tongue. When it ages naturally, the leaves oxidize and microbial residents get to work. As the 10-year mark approaches, the aromas of dried tobacco, camphor, dried fruit and incense overcome the flowers and vegetal notes. Every year adds to the tea’s smoothness and depth. The best puer can linger in the throat and flush the chest and forehead, occasionally to a psychotro- pic degree. It is almost impossible to fall in love with aged puer without wanting to collect it. In 1972, a 28-year-old Hoffman returned to the United States after almost a decade abroad, with the seed of his vast collection in his backpack: a mushroom-shaped cake of puer. A former engineering student at San Jose State and son of a successful wallpaper manufacturer in Oakland, Hoffman had left the country just after Kennedy was assassinated in 1963. On his destination-less pilgrimage, he traveled to more than 100 countries, staying the longest in Nepal, Afghanistan and India, where he lived in Tibetan refugee settlements and fell in love with tea. “Most of the world are tea drinkers,” he recounts. Each time he says “tea,” his voice rises and falls, resonating like a chime. Soon afterward, he bought a 11⁄2-acre parcel in the steep Lagunitas hills for $38,000, adding another half-acre later. Like many of his back-to-the-land neighbors in West Marin, Hoffman set out to transform the property himself. Unlike them, he never stopped. A chicken coop appeared, then became a bedroom. He razed a carport to construct an ornate tea room. The structures multiplied, whimsy inseparable from function: A retaining pond and well whose pump was housed in a mock tugboat. A “Solar Power Shower Tower.” An elaborate system for filtering rainwater, gray- water and blackwater through pools, worm beds and terraced organic gardens. Hoffman attributes his 45-year fascination with organic farming, vermiculture and wastewater systems to his time in India and Nepal. Other fascinations developed over the years. “I’ve been cursed with too many passions in life,” he says. He planted 5 acres of heirloom wheat varieties and milled the grains himself. The garden plots filled with rare potato plants he imported from Peru. When he switched from wood-fired stove to solar cooker, he discovered that cooking in stone pots gave him the best flavor (“I hate plastic,” he adds, with malice), and so he flew to South Korea to commission pots of his own design. A series of businesses helped fund the construction. Books. Rugs. He invented a method to clean ancient textiles for museums with sonic vibrations. Scouting tea was a hobby that grew into another enterprise. “I made my first trip to China because I couldn’t find any good tea here,” he says. In the early 1990s, Hoffman sold the textile-cleaning equipment he’d invented and traveled even more widely — to Zhejiang province for flat-bladed Dragonwell, to Guandong for spindly, floral Phoenix Mountain oolongs. He began collecting puers in Hong Kong teashops and ended up visiting farmers in the mountains of Yunnan. Despite the fact that he was not fluent in spoken or written Mandarin, each trip brought him to new regions and rarer teas. As the export market opened and his reputation grew, the Chinese feted him with television profiles and industry banquets. Silk Road Teas, operating out of Hoffman’s property, primarily sold to retail brands like Republic of Tea, but also tapped into an audience willing to pay for premium Chinese teas. Sebastian Beckwith, co-founder of the New York City- based In Pursuit of Tea, says that where other companies would import a couple varieties of green tea, Hoffman would sell 30. He’d spend half an hour on the phone with a curious collector who’d end up spending $30. “David did more for education in the early (U.S.) market than anyone else,” Beckwith says. Hoffman added to his construction projects a cave where he could age his teas without requiring electricity for air circulation or climate control. He excavated into the hills, pouring 100,000 pounds of concrete to line the walls. There, from the 1990s to the mid-2000s, Hoffman filed away teas by the tons — actually, tens of tons. By 2002, Silk Road Teas was doing $1 million in gross annual sales despite the fact that, as Hoffman frequently jokes, he had no innate talent for business. When he decided that the company had grown too unwieldy, he sold it to Catherine and Ned Heagerty, the latter a former Silicon Valley entrepreneur. The sale, finalized in 2004, did not include the contents of the tea cave, which Hoffman attributes to Heagerty’s disinterest, and Heagerty to Hoffman’s unwillingness to part with his puers. Hoffman consulted for the new owner for a few years, but eventually parted ways. In those days, puer was so cheap that he amassed 200,000 pounds of it. Many of the teas he bought, like the baskets and logs on display at the Tea Museum, were heicha, or non-Yunnanese fermented “dark teas,” which were little known even in China. Around 2010, Hoffman started the Phoenix Collection, competing directly against the company he’d sold just six years before. In those short few years, the Chinese puer market had changed. In 2006 and 2007, a frenzy of speculation on puer cakes gripped China, akin to the 17th century Dutch tulip craze. Farmers picked every bud that sprouted, trying to meet the demand. Fakeries proliferated. Investors tracked the skyrocketing price of their holdings in the puer press. As Jing- hong Zhang chronicled, unpressed tea from Yiwu, one of the most famous mountains, shot up from 50 to 120 Chinese yuan per kilo in 2005 to over 400 yuan ($92) in 2007. A year later, the market collapsed, and the price dropped by three-quarters. The boom and bust, however ruinous to speculators, signaled to all of China the value that Cantonese and Taiwanese collectors had long placed on aged puer. Prices slowly rebounded, eventually surpassing the heights of the boom. Merchants now compete for the best leaves, valuing those from older, wilder trees over Communist-era plantations. As incomes in China have risen, so, too, has the Chinese market for high-end teas. “The domestic market has become my biggest competitor,” Heagerty says. A new generation of tea producers and vendors, many based in China, has arisen to supply this market, selling through their own websites or via eBay. Online, specifics are everything: which mountain a tea comes from, whether the trees came from a plantation or a semi-wild arbor, even the name of the farmer. In the case of older puers, vendors may specify whether the tea was stored in dry or humid conditions, considering how significant the effect humidity has on the taste of aged puers. Hoffman professes ignorance of the online community, and for the most part, they ignore him, too. The Phoenix Collection accepts orders only via telephone, but the real disconnect is in its approach to tea. Hoffman says, “You should never buy a tea you haven’t tasted.” The online community can’t visit Lagunitas. The lack of specifics in his catalog is befuddling. Hoffman makes regular forays into the cave, excavates another haul, then figures out what he’s discovered. He doesn’t read much Chinese, so he briefly names and dates the teas based on the sketchy information he remembers about their provenance, trusting in his palate. (His palate, several people in the industry confirm, is excellent.) There is no Chinese equivalent to Hoffman’s Northern Californian tea cave, either, so only those who taste his teas in person can verify whether they are aging well. At the same time, the Phoenix Collection’s mailing list has grown to 1,000. Chinese merchants have sniffed out his collection, too. They fly to the Bay Area to snap up choice older vintages, selling them to wealthy collectors back home for thousands of dollars. When I visit the Last Resort for a tour, Hoffman won’t even point out where the tea cave is. Instead, we sit on a terrace looking over his property and the wooded valley below. A breeze through the Lagunitas hills directs the wind chimes in a fairy-bell cantata. Hummingbirds buzz our ears. We can feel the vibration of their wings. After 45 years of construction, the Last Resort resembles a village in the Himalayas, or perhaps the set of “Game of Thrones” a few weeks before filming. Buildings push against one another as if they are huddling for warmth, linked by walkways and steps that require caution to navigate. Pot shards, boards and doll heads are heaped in random corners. The canted, tiled roof of Hoffman’s unfinished magnum opus, his tea room, may dominate the view, but it’s easy to get distracted by other sights. A boat. A baby bulldozer. The Grand Pissoir, his compostable toilet, to which the county of Marin particularly objects. Court records show that the county issued its first stop-work order in 1988. The county issued new violations in 1999, then again in 2000, 2001, 2007, 2009 and 2011. Hoffman waved them all off. “Back then there were people in the county that loved my place,” he says. He claims when he asked the senior building inspector what he needed to do to bring the property into compliance, the guy winked and told him to get out of there. As Hoffman tells of his fight with Marin County, a trickster theme keeps bubbling up — the wily rascal who has spent his life flouting authority in Afghanistan, China and Lagunitas. The inventor as stubborn iconoclast. The visionary, forging ahead of thelaw. Those old Marin bureaucrats have all retired. Now, according to county counsel Bryan Case, the county just wants Hoffman to make his property safe. The violations aren’t limited to bad wiring or overly steep steps. According to a December 2016 evaluation that building forensics consultant LaCroix Davis prepared on the Last Resort, the self-taught builder has constructed houses that might collapse in an earthquake and wells that might drown someone who accidentally falls in. Environmental health inspectors have also expressed concern that Hoffman’s blackwater system would contaminate a nearby watercourse and the San Geronimo Creek. After the county court ordered Hoffman off the property in 2012 and levied $226,672 in fees — he refused to pay, he kept building — it finally appointed a receiver in 2015. The receiver, Eric Beatty, is charged with bringing the property up to compliance, using its value to pay all fees and expenses. Some structures may need to be demolished for safety. Hoffman claims that, with interest included, the county wants him to pay a half- million dollars and worries it could easily acquire the money by razing the land and selling it, bare. Beatty asserts that he is proceeding slowly with the evaluation and remediation. He has let Hoffman live on the property, only insisted the Phoenix Collection move off-site — hence the shop and Tea Museum down the hill. In the meantime, hundreds of Hoffman’s supporters and neighbors have rallied around his eccentric estate. They’ve filed petitions, met with county supervisors and appealed to the county architectural commission, updating supporters through a website, thelastresortlagunitas.org. They are trying to secure historic preservation status, although the property is six years short of the required 50-year mark. Another trick for the trickster. After fighting the county for a decade now, however, he’s exhausted. Lyme disease has shrunk his ambitions even further. “My goal is to sell off all the tea and then close the doors,” he says, staving off demolitions and evictions long enough to do it. He has 100,000 pounds to go. Phoenix Collection Tea Museum, 7282 Sir Francis Drake Blvd., Suite 1, Lagunitas; (415) 488-9017, thephoenixcollection.com. David Lee Hoffman is an American man who popularized pu’er tea (普洱茶 pǔ’ěr chá) in the U.S., and is even credited by many with inspiring a cult-like devotion to the fermented tea variety amongst tea connoisseurs in China itself. The San Francisco Chronicle has published a profile of Hoffman that tells the story of his rise to pu’er fame, his extraordinary collection of tea, and the threats he faces from the Marin County government for code violations on the property where he stores his tea in a cave. Article “Tea Purveyor Faces New Twists, Mounting Bills” published on 01/05/2017 in the Point Reyes Light about David’s current situation. A grand Japanese farm- style roof, a boat amidst a pool of rainwater, and lush green plants growing atop an outside restroom are some of the most eye- catching features of famed tea importer David Lee Hoffman’s ornate Lagunitas home. 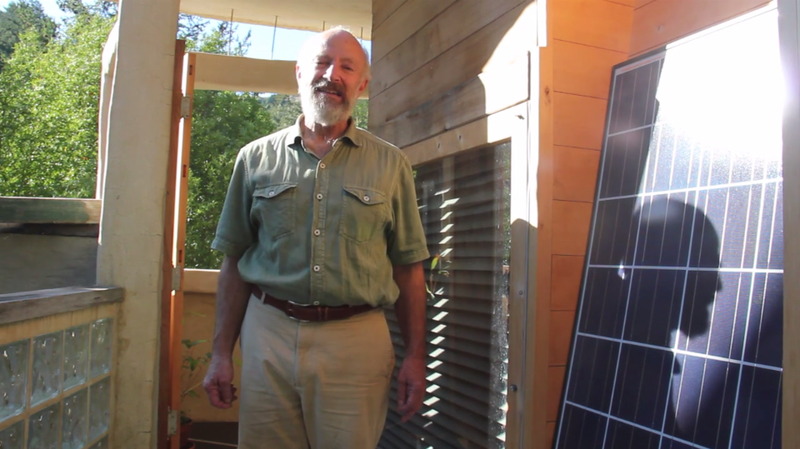 For Mr. Hoffman, how- ever, it is sustainable living systems that he has installed and invented on his two adjacent proper- ties—which he calls the Last Resort—that are paramount. “For me, this place is about the systems, not the structures,” he said at an open house he held on Saturday. Mr. Hoffman orga-nized the event, which drew perhaps 200 friends and supporters over the course of the day, because he fears that his compound is in immediate jeopardy: Three years after a court judgment in the county’s favor, his lawyer said the county wants to place his property under a court-appointed authority to tackle the dozen or so unpermitted buildings and code violations. The county’s code enforcement specialist, Cristy Stanley, confirmed on Wednesday that this is indeed the case. “Citing health and safety concerns, the County has elected to seek the appointment of a receiver to remediate a long list of significant code violations on David Lee Hoffman’s residential properties,” she wrote in an email. In 2012, Mr. Hoffman was fined over $200,000 by a judge, after the county charged that he had built a vast array of structures without permits and that his water recycling systems could contaminate the watershed. (Those fees, with interest now roughly $300,000, have been tacked on to his property tax bill, Mr. Hoffman’s lawyer said.) 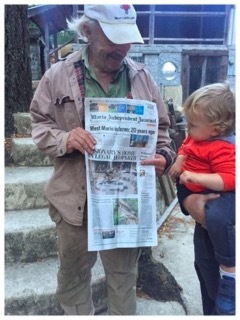 Mr. Hoffman freely admits to building without permits for decades, but stresses that his system for recycling human waste is “completely closed.” Advocates have hoped to secure historic status for the place—as representative of the environmental movement of the ‘60s and ‘70s, and as an “artistic environment”— but so far that effort has not borne fruit. Mr. Hoffman, widely credited as one of the first to bring high quality teas from China to the United States, is now in the process of winding down his tea import business, the Phoenix Collection, which he started in 2009 after selling his previous tea business in 2004. He made his final trip to China just a few weeks ago, and he will cease operations when he sells the remainder of the tea, likely within a year. The county says he cannot operate the business out of his home; after a recent rental opportunity fell through, Mr. Hoffman, who is in his 70s, decided that he is too exhausted to keep going. Fearing his days of owning the Last Resort are also numbered, he hosted this weekend’s event to educate people about living sustainably and, in particular, the power of earthworm-based composting, or vermiculture. He also wanted to celebrate: it was both Mr. Hoffman’s birthday and the anniversary of the day he moved to the property. Between and after lectures, guests sipped on oolongs and pu-erhs out of thimble-sized white cups, munched on roasted eggplant and falafel in pita bread, and ate forkfuls of moist chocolate birthday cake. Mr. Hoffman, in a brown linen shirt with a Nehru collar, said he has been working with earthworms—“one of the most important creatures on the planet”— for 44 years. The worms that today turn left over food scraps and human waste into compost all descend from his original cohort. In his “Worm Palace,” a six-foot long container, the annelids create compost from a mix of food scraps, kitchen grey- water, and calcium from cooked bones and oyster shells. The worms turn this mixture into worm castings, a nutrient-rich fertilizer, which he uses to grow vegetables. To him, this epitomizes the crucial cycle of ecological living. On Saturday, he scooped a handful of crawling worms out to show a small group listening to his presentation. “Smells like good, healthy earth,” he said, offering his audience a whiff. Then there is his more contentious system, which he calls the Grand Pissoir. It’s a toilet that sends human waste—along with scoops of carbonaceous material to provide the right balance of nutrients— to another group of earthworms. Once the worms eat it, it’s “not poop.” Then he corrected himself. “Well, it’s worm poop,” or fertilizer akin to that created from kitchen scraps. He got the system fully functioning just last year, he told the crowd. The water that flushes the toilet is filtered, he says, then pumped to the roof where it is “bio-filtered” through plants and soil, and then it goes back to the toilet. Rainwater replenishes the system as water evaporates. “This system is easily scalable,” he said, and can work with just six hours of sunlight a day and at least 20 inches of rain a year. But, he conceded, the politics of operating a system that recycles human waste is complicated. “The laws of nature and the laws that we create don’t match up,” he said. Mr. Hoffman has paid for a hydrologic study of the property, a final draft of which is due this week, to prove that those systems are safe. Mr. Smith said he hopes to find a way to convince the county not to appoint a receiver but instead bring in a construction expert to evaluate the buildings and try to bring what was deemed unsafe into compliance. SPACES, a website that aims to document and archive art environments around the world has created a page on their website devoted to The Last Resort. The director of spaces, Jo Farb Hernández also pledged support for The Last Resort in a letter the Marin County Board of Supervisors. See the letter here. Jim Edelhauser & Cecile Lelievre have put together a short film documenting Le Grand Pissour. Watch it here.